It is a project which is implemented by both the centre and the state governments across various states in India to reform and strengthen the Panchayat levels. This RGSA scheme is sponsored by both the central govt. as well as the state govt. Funding methodology 75% centre and 25% state. The RGSA is a unique scheme which was proposed to develop and strengthen the Panchayati Raj system across India, mainly in rural areas. The main motto of the centre behind promoting this scheme is to make development in rural India, which will subsequently lead in development in whole country. The main motto of the scheme is to train and assist the Gram Panchayats who get elected across the country so that they can perform their work efficiently in the basic level. Several responsibilities for the rural development are given to the gram panchayat leaders who work maintaining liaison with the state govt. The gram panchayats will be given skill development training under the RGSA scheme. Several capacity building and training centres will be formed for the training of the gram panchayats at several levels like gram panchayat level, block level and zilla parishad level. The centre will be the main player here which will assist the states to promote and implement the RSGA so that capacity building of the gram panchayats can be done efficiently. After gram panchayat elections, the elected members are given the responsibility to perform the administrative and governance works at grass root level i.e. the panchayati level. In the recent Union Budget of 2016 – 2017, the Hon’ble Finance Minister Shree Arun Jeitley has announced that a total of Rs. 2.87 lakh crore is to be allocated for the strengthening and development of the gram panchayats and municipalities. In the latest 14th Finance Commission, the budget allocation in this sector has been the highest, compared to earlier commissions. Almost there is a major jump of 228 per cent from the previous 13th Finance Commission. Hence, this will imply that every gram panchayat will get around Rs. 80 lakh for its overall development. Whereas, the urban municipalities will be getting around Rs. 21 crore each. The RGSA scheme has been brought up with a corpus of RS. 655 crore. The RGSA scheme will be implemented with the funding pattern of 75 -25, where the 75 per cent will be the contribution of the centre and the remaining contribution will be of the individual states. Under this segment, the states along with the assistance of centre will arrange for training centres and skill development workshops for the elected members of the gram panchayat and panchayat officials. All the Non – BRGF districts will have the implementations. BRGF districts are those districts which are already receiving funds from the centre due to backward regions. The training centres with institutional capability will not only have regular training schedule, but also distance learning programs for the elected representatives of the panchayats. PESA is a panchayat amendment act which deals with ensuring regular elections in panchayat bodies. After the full implementation of PESA, special needs of the common people must be fulfilled along with preservance of their cultural traditions. The main component to be promoted in training of the panchayat members is the idea of planning and process. As the administration in the primary level in districts are held by the Panchayati Rajs only, it is very necessary for the panchayat elected members to have proper planning skills. The RGSA scheme is entirely a demand driven project to be implemented in the rural gram panchayats as well as the municipalities also. Hence the centre is keen to start the e-governance system under this project. This will enable the centre to get connected with the grass root panchayat system via e-goverance. The centre, in association with the states will provide assistance to develop and establish panchayat bhawans or resource centres for the gram panchayats across districts. Also works for sensitizing the political parties, citizens and media needs to be done and special effort from both the centre and the state needs to be made. Special mobilization campaigns for the panchayat members of gram sabha must be done. Why is the Rashtriya Gram Swaraj Abhiyan (RGSA) needed? The RGSA will empower the panchayat systems in India. Under this scheme, the members of panchayat will be provided skills on decision making, expenditure management, information systems, delivery of services to the people, interacting with common people, etc. Special training for the new entrants of the panchayats, women and members of SC / ST category will be held before they take up the office. The officials have put the figure that a total of around 2,85,000 Gram Panchayats will be directly benefitted with the RSGA program, throughout the nation. Earlier scheme was named as RGPSA after the name of former Prime Minister Shree Rajiv Gandhi. The governing authority of the RGSA scheme is the Ministry of Panchayati Raj. The NDA Govt. has decided to reconstruct the scheme and has named it RGSA to strengthen the Panchayati Raj system across the nation. This scheme was first brought up in the year 2006 and implemented in 2007 under the twelfth 5th year plan. 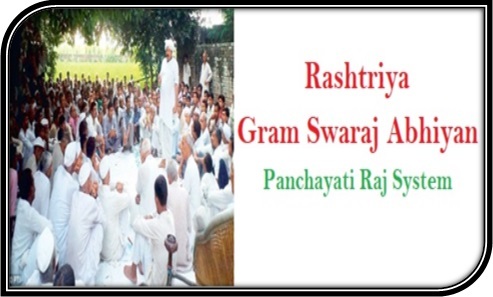 Rashtriya Gram Swaraj Abhiyan is an initiative by the central government of India. It will start from 14th April 2018 and will continue till 5th May 2018. According to the initiative, all the ministers in India from several states will go and live for a night in villages that contains Dalits, Scheduled Caste, Scheduled Tribe and economically backward classes. The ministers will have to make them understand various development schemes like Ujjwala Scheme, Jan Dhan Yojana, Awas Yojana and many others. Indian Prime Minister made an announcement on the 6th of July, 2018 that around 5 lakh families in West Bengal will receive free LPG connections. As of now, the facility will be available in some rural areas only. It will be done as per the guidelines of Gram Swaraj Abhiyan. It aims at offering smokeless cooking facilities to rural women. The free connections will be offered by IOCL. Central authority desires to complete the process before 15th August, 2018. The selection of 7,364 rural areas is complete. With this scheme, IOCL will start its journey of reaching 98% houses in West Bengal. Work has started since 14 April, 2018 to finish this task with set deadline.